This post was written by Diana Birney, Supervising Marine Biologist for our upcoming SHARK! exhibit, opening August 29, 2015. We fear them, we love them, and we are fascinated by them. We have a whole week on television dedicated to them that draws millions of viewers every year. Humans have an amazing obsession with this interesting group of animals, especially considering that we really don’t know that much about them. It’s clear from the popularity of movies like Jaws and Sharknado that we love to be scared by sharks. While there is a good reason to give sharks their space, they are not the crazed “man-eaters” that Hollywood has often portrayed. In fact, since 1911 there have only been two deaths and less than fifty unprovoked attacks by sharks in Texas. You’re actually more likely to be struck by lightning than you are to be attacked by a shark. However, every time you enter a body of water, you should go in with the knowledge that a shark could potentially be there. When it comes down to it, it’s their space — not ours. There is no evidence to suggest that sharks like eating people. In fact, considering the numbers of people that go to the beach and the attack statistics, it would seem that sharks DON’T like eating people. A beach is a potential buffet at certain times of the year, but the sharks don’t seem to take advantage of it (good news for us!). When people do get bitten, it’s usually one bite and the shark lets go. This is similar to the other night when I had a plate of broccoli I was going to town on and ran into a bite of mushroom (I hate mushrooms). I promptly spit that nasty bite out and went back to my broccoli feast (YUM). Sharks tend to follow schools of fish or, for our larger shark friends, mammals such as seals. Schools tend to frequent coast lines and often when someone is bitten there is a school of fish in the area that the shark was intending to chow down on. Sharks can sense blood in a ratio of one part per million. They also have sensors on their noses called ampullae of Lorenzini. These are electroreceptors that can sense the electrical field given off by everything swimming around in the ocean — including you and me! If a wounded person or animal enters the water, a shark can be drawn to the blood but also to the electrolytes that pour out of the wound as well. There is a common idea that punching a shark on the nose will make it less likely to attack you. This stems from the fact that the ampullae are all over the nose and punching the shark might disrupt the electroreceptors. Another reason this (sometimes) works is that most sharks like certain prey items and most of those prey items don’t know how to punch — giving the shark a strong clue that it won’t like eating you. However, it’s important to not just go around punching sharks… right under their nose is a huge mouth with lots of teeth, and you may end up just losing an arm instead of scaring the sharks. A good rule of thumb in any environment is that if it has teeth it can/will bite. Having a buddy is essential for beach safety. Rip tides can pull even proficient swimmers down and out into the ocean (and are actually much more likely to happen to you than a shark attack). Sharks, just like other apex predators, e.g., lions, tend to go after prey that is separated from the pack — it makes for an easy dinner. So if you are swimming alone a shark might think you are a solitary prey item. 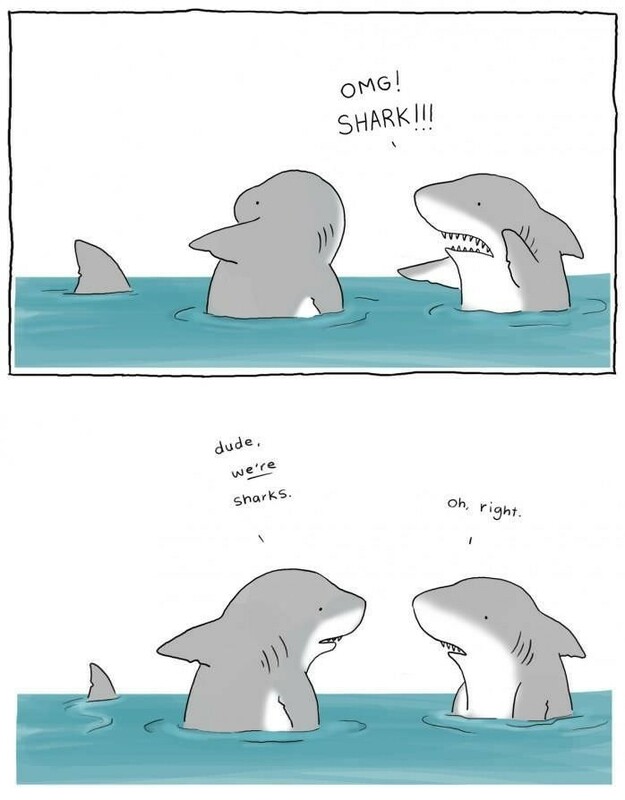 If you are with someone else, the shark might still think you are prey, but will be less likely to attack a small “pack” rather than a solitary animal. The buddy system is also beneficial just in case something does happen. Your buddy can get help and report exactly what happened in case you are in shock or missing. Most sharks hunt at night, dawn and dusk when they can see the best. Fortunately, most people go to the beach during the day. Just be extra careful if you are going out in the evening or at night because the shark can see you better than you can see them, guaranteed. However, if you are in an area frequented by White Sharks remember that they tend to hunt during the day when their traditional prey are more active. It’s important to know what signs indicate a higher chance of sharks in the area. Sandbars and the drop offs around sand bars are a common shark hang out. Sharks can swim in extremely shallow water, so don’t let the low water level lull you into a false sense of security. An easy sign of sharks to watch out for is the presence of other animals. I know it’s hard to stay back when you see a bunch of fish in the water (as a Marine Biologist, I can be guilty of not staying away from schooling fish), but sharks enjoy snacking on large groups of fish. We wouldn’t want you to end up a morsel in the shark’s buffet. However, we can’t always see schooling fish. Don’t worry too much since there are more obvious signs you can watch out for including: birds, dolphins/porpoises and lots of splashing. Birds will attack schools from the air, so if you see many birds diving in a particular spot, you can safely assume there are fish there and will want to stay away from that location. Same with dolphins and porpoises. They eat a lot of the same foods that sharks eat, so do not assume there are no sharks just because you see dolphins. Splashing is also a key sign to sharks that prey is in the area since schools of fish tend to ascend and splash around near the surface. So, again, stay away from areas that show signs of splashing, and it’s also a good idea to keep your splashing around to a minimum. It’s also good to know your local sharks. The Gulf of Mexico is home to many different species, some sharks you might not see — much less have to worry about. Others, like the Bull shark account for all of the Texas deaths from sharks (don’t be too alarmed, again, there have only been 2 since 1911). We also have thresher (my personal favorite shark), nurse, blacktip, tiger, many different hammerhead species, and many more. If you followed the news this summer, you might have seen a White Shark named Katherine approaching Texas. Katherine shows us that we can get Great White Sharks in the Gulf. For more information on Katherine and many other tagged sharks you can go to OCEARCH.org. If you are travelling and plan on going to the water, it’s helpful to know what sharks are in the area and how likely your are to see them. In the long run, it’s important to remember that shark interactions are NOT common, you just want to be prepared and armed with knowledge whenever you hit the beach. The Houston Museum of Natural Science is teaming up with the Texas State Aquarium and OCEARCH to bring more information and awareness of sharks to Houston with our new SHARK! exhibit. Come visit to learn about (and even touch!) these amazing animals starting August 29!